An Inuit kiss in modern Western culture is the act of pressing the tip of one's nose against another's. It is loosely based on a traditional Inuit greeting called a kunik. A kunik is a form of expressing affection, usually between family members and loved ones, that involves pressing the nose and upper lip against the skin (commonly of the cheeks or forehead) and breathing in, causing the loved one's skin or hair to be suctioned against the nose and upper lip. It is an intimate greeting used by people who, when they meet outside, often have little except their nose and eyes exposed. When early explorers of the Arctic first witnessed this behavior, they dubbed it Eskimo kissing. In its western form, it consists of two people rubbing noses together. One of the earliest representations of the 'Eskimo kiss' was shown in Robert Flaherty's 1922 film Nanook of the North, considered by many to be the first documentary or ethnographic film. Many people of the non-Inuit/Eskimo public may first have learned of this convention from the film. Other peoples use similar greeting practices, notably the Māori of New Zealand and Hawaiians, who practice the hongi and honi greetings, respectively. VIDEO Watch and learn the technique behind a true "Inuit Kiss". 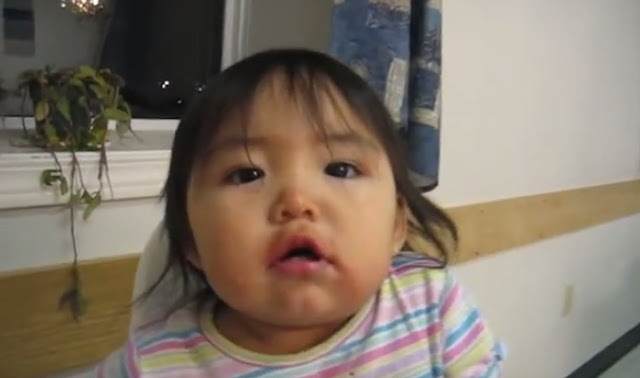 Responses to "Cutest Inuit Child Gives Us A True Traditional Kunik (Inuit Kiss)"